Li-Ning Sporting Goods Co. Ltd. offers it's customers a comprehensive selection of badminton equipment that is designed to suite all levels of badminton play. Our badminton equipment is manufactured to the highest possible standards in professionally managed OEM factories. Producing the highest quality badminton products possible is paramount for the Li-Ning company and stringent quality controls are always in place to ensure that our customers are satisfied time and time again. The top notch quality is apparent when you pick up our badminton equipment and we are confident that you will agree that there's no other badminton equipment brand in the business that works as hard as we do to ensure your complete satisfaction. If you are an avid badminton player you will be thrilled to know that many of our badminton products are designed for the China National Badminton Team and as such, they must perform and withstand the rigours of top ten international level play. Many of our top sponsored athletes participate and provide input in the design and engineering of our products. This helps us ensure that Li-Ning badminton products are built to last and perform at a level that meets or exceeds your expectations. Our manufactured products are of exceptionally quality with high performance to match. If you have not yet experienced our products we urge you to give them a try. We guarantee that you will be pleasantly surprised! The following badminton equipment categories can be found in our domestic retail stores and through our ever expanding network of international distributors. Be sure to click on the links to learn more about the specific badminton equipment listed. Li-Ning Sporting Goods is one of the world’s leading manufacturers of badminton rackets and produces over 50 different badminton racket models for you to choose from. If you are just beginning to learn how to play badminton consider a badminton racket from our Ultra Sharp series as these models tend to be light weight and easy to swing. If you are a younger and more powerful badminton player take a look at our Mega Power badminton racket series. This series is for big attack and explosive play styles and will deliver the aggressive power that you are looking for from a famous brand name badminton equipment company like Li-Ning. We also offer Ultra Sharp series badminton rackets which are designed to feel slightly lighter than our Mega Power series badminton rackets but will still help you generate lots of explosive power. Our top of the line badminton racket models are made from military grade carbon fibre which allows for string tensions of up to 30 lbs, makes the badminton racket very strong and feel amazing to play with. Li-Ning badminton rackets are sold through thousands of retail stores in China and through our ever expanding network of Li-Ning Badminton distributors. Please click on the distributor link on the left menu to find a country specific distributor to serve you. Playing the sport of badminton with high quality badminton shoes makes playing badminton more enjoyable and safer for the athletes. Our Li-Ning badminton shoes are made with the finest quality synthetic materials available and are offered at various price points to ensure that we always have a badminton shoe to meet every budget. You will find that our badminton shoes fit well and are comfort focused. The more comfort technology built into the shoe the higher up the line it’s positioned. You will also find that our badminton shoes are engineered to be supportive and stable. This helps to prevent soreness after a herd played badminton session and helps to prevent injuries. Our badminton shoes are offered in men’s, women’s and kids models and we strive to offer you badminton shoes in the latest and greatest styles and colors. Many of the top international level badminton players in the world use Li-Ning badminton shoes due to their superior construction and unmatched performance. Our industrial badminton shoe designers are continually developing new technologies to improve durability and breathability all while reducing the overall badminton shoe weight. If you have never tried a Li-Ning badminton shoe, we strongly urge you to do so. We know you will be pleasantly surprised. Badminton is the only game in the world that is played with a shuttlecock or shuttle shaped projectile. 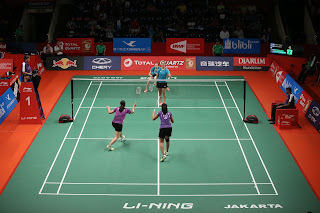 This makes badminton truly unique and is a major reason the sport is one of the most popular amongst Asian countries. 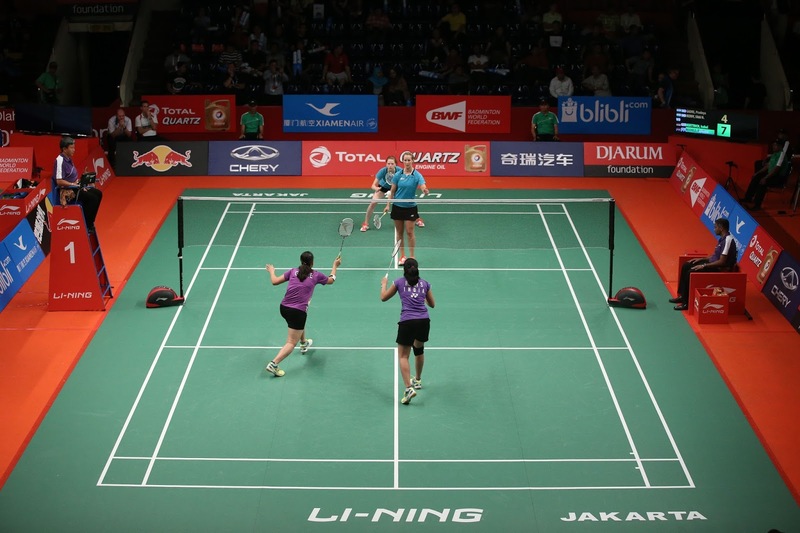 In fact, badminton is the National sport of Indonesia and is the second most played sport in the world (by participation). Li-Ning offers numerous badminton shuttlecock models that manufactured to meet specific performance levels and price points. Our entry level badminton shuttlecocks are made from duck feathers and are ideal for beginners or those that are looking for a good quality training shuttle. Our most popular shuttlecock is made from high quality goose feathers which tend to last longer and fly true. Badminton players of all abilities enjoy these shuttlecocks because of their outstanding performance and excellent price point. Our international level tournament sponsorships include our highest grade of badminton shuttlecocks due to the player’s high demand for durability and near perfect flight characteristics. We even offer an excellent line of nylon or plastic shuttlecocks to ensure that we have something for everyone. Li-Ning badminton shuttlecocks can be purchased at thousands of retailers in Asia and through our international network of Li-Ning badminton equipment distributors. We are a world leader in badminton clothing and apparel and offer you the most extensive selections of badminton clothes you will find in the business. Our badminton clothing styles and colors are continually changing with the latest fashion trends and we are the clear leader in badminton apparel worldwide. We design and manufacturer our badminton clothing for men, women and children and offer t-shirts, polo shirts, shorts, skirts, skorts, warm up pants, warm up jackets socks and more. When you try on our badminton clothing you will notice the fine attention to detail and exceptional fit and finish. Our top of the line badminton clothing is used by the world famous China National badminton team which helps us to ensure that the fit and performance of our clothing meets or exceeds even the demands of the best players on earth. New design and produce fresh badminton clothing designs about 4 to 6 times per year to ensure that you always have the largest selection of badminton clothes to choose from at all times. No matter what apparel you may need, you can count on Li-Ning and our international distributors to work hard to earn your badminton equipment business as we emerge as one of the largest badminton product companies in the world. There are many badminton bag options out there for you to choose from but we are confident that you will be hard pressed to find a badminton bag like a Li-Ning badminton bag. Our products boast high quality designs combined with cutting edge technologies to make what was once a boring but necessary badminton equipment product, exciting yet fully functional. You will find premium features like durable stainless steel zippers and industrial grade double stitched seams for the ultimate in performance and durability. We also make our badminton bags from extra strong materials like vinyl and polyester to ensure years of worry free enjoyment. Li-Ning badminton bags are typically made in 3 racket, 6 racket and 9 racket configurations and include handy features like waterproof pouches and dedicated shoe compartments. Many models feature areas to safely store smaller items like wallets and keys and our ultimate badminton bags even have radiant foil construction inside to protect your badminton rackets and other badminton equipment from extreme heat and cold. After investigating our Li-Ning badminton bags we are confident that you will agree that there is not better bag on the market and the large selection of styles and colors ensures that there is a badminton bag for everyone. In addition to finding a Li-Ning badminton racket that you love, it is equally important to find a Li-Ning badminton string that you love just as much or more. This is why Li-Ning offers badminton strings in many different models and a rainbow of colors to match your badminton racket paint or just stand out on your badminton racket frame. Our badminton string is typically offered with three distinct characteristics. The first is repulsion. Our thin strings at 0.65 mm will generate superior repulsion power because it has the best ability to stretch and rebound causing an increase in performance and power. Our thin badminton strings also has sweet hitting sounds and is surprisingly durable. Our medium badminton string is 0.69 mm thick and includes a nice blend of repulsion power and durability. This string our most popular badminton string because it offers the best of both worlds and is not easy to break even if you miss hit the badminton shuttlecock at the top or bottom of the badminton racket string bed. Our thicker badminton string is 0.70 mm and is our strongest badminton string. It is ideal for beginner and novice badminton players that have yet to develop their badminton skills and tend to miss hit the shuttle and break their strings. High performance badminton play along with high performance Li-Ning badminton rackets can often be complimented with the application of a badminton grip tape. Li-Ning badminton rackets and precision manufactured with one grip size which is extra small. If you have larger hands and would like a larger badminton grip you will need to apply one or more layers of badminton grip tape. There are a few types of badminton grip tapes including standard, ribbed, perforated and towel. Standard grip tape is our best seller and we offer this product in a single package in a large range of colors to match your Li-Ning badminton rackets. Ribbed badminton grip tape adds a small piece of thin soft foam in the middle of the tape to give the racket handle a little extra traction and feel. Our perforated grip tape has tiny holes throughout the product to allow it to breath and stay dry longer. And finally our towel grips are made from a highly absorbent terry cloth type material and are preferred by high level athletes that play long and grueling matches. So no matter what type of badminton grip tape you prefer, you can count on Li-Ning to always deliver a great range of products and colors to ensure you enjoy the game of badminton to its fullest. The badminton net is a critical component of the game of badminton and there is nothing more fun than a properly installed professional badminton net. A properly installed badminton net extends the full width of a regulation badminton court which is 20’. A nice tight rope throughout the badminton net tape ensures that if a badminton shuttlecock hits the net it is either stopped correctly or tumbles across the net on the other side in a manner that is difficult to play but not impossible. It is also important for the badminton net to have strings on the sides to attach to the net posts. Li-Ning offers performance badminton nets in a number of different models. The main difference between the models is the density of the badminton netting. The badminton netting on our professional models is 12 ply and the density on our premium models is 24 ply. The higher the badminton net density, the more durable it is which ultimately makes it last longer. Li-Ning also offers badminton nets that slip over the badminton net posts for a cleaner, sharper look. No matter what badminton posts you have or what your badminton net requirements may be, we have something that will suit your needs. Badminton can be played on many surfaces including wood and rubber gymnasium floors. For those that have experienced playing on synthetic badminton court mats, they will agree that it is the most fun with the best shuttlecock visibility and line visibility. Li-Ning badminton court mats are available in numerous models with the main difference being the material that the mats are made from. Badminton court mats are made from two key materials. They are PVC and TPU. A PVC badminton court mat is a durable and economical solution and is the type of mat that is most commonly used. Badminton court mats that are made from TPU are more durable but considerably more expensive. One of the main considerations when choosing a badminton court mat is the number of seams and the type of fastening system. The less seams, the better because there is less to go wrong. More seams mean more points that are fastened and this is the part of the badminton court mat that may wear first. The mats can also be ordered with a Velcro fastening system or a welded fastening system. Velcro fastening systems make the court mat portable and welded court mats are permanent. No matter what your application, Li-Ning has a product to match your needs with expert advice and help you with your purchase decision. It is impossible to professionally string a badminton racket without a premium badminton stringing machine and Li-Ning is a leader in the market in this regard. Li-Ning badminton stringing machines are a precision made, work of art that screams quality, quality and quality. We offer an economical manual badminton stringing machine option as well as fully electronic version. The electronic version is the most popular with clubs and pro shops that offer stringing service as a revenue stream. The electronic badminton stringing machine version boasts advanced features like pre-stretching and fully electronic string tension control. It also speeds up the time it takes to string a badminton rackets due to its efficient industrial design. Our manual badminton stringing machine is also a very high quality machine but due to its mechanical crank and manual string tension selector, it is offered at a more economical price point. All of our badminton stringing machines includes our vibrant Li-Ning branding and machine polished metal appointments. A hand badminton stringing machine tool bag is also included to ensure that you have everything that you need to start stringing badminton rackets for yourself or for your business from the moment that you receive it. To round out your badminton ensemble and to ensure that you have everything you need to enjoy the game of badminton to its fullest, we offer a full range of badminton accessories for you to choose from. Li-Ning badminton creates one of the largest selections of badminton accessories in the business including towels, water bottles, wrist bands, head band, hats and more. We even offer athletic support braces such as knee braces, ankle braces, wrist braces, elbow braces and back braces. Our exciting badminton accessories are manufactured to the highest quality standards to ensure your complete satisfaction. We strive to scour the world for top quality badminton accessory products and bring you the most up to date badminton accessory trends and colors. From our vibrant wrist and head bands to our casual badminton hats and badminton visors our badminton accessories will add that extra touch of class that you are looking for and will complete your badminton ensemble. Our goal is to bring you the widest selection of badminton accessories in the world to complete your one stop shop badminton equipment shopping experience so be sure to review our excellent badminton accessory offering in our Li-Ning retail stores and international distributors through the world.